This Easter been has been fabulous, I mean really fabulous, in an usually blue skied, warm sun kind of a way. That being said, it was the obvious time to make a rice pudding, right? Thought so! Until now it never really occured to me to pair pale creamy luscious rice pudding with pink, tart rhubarb, but as they say “better late than never”! 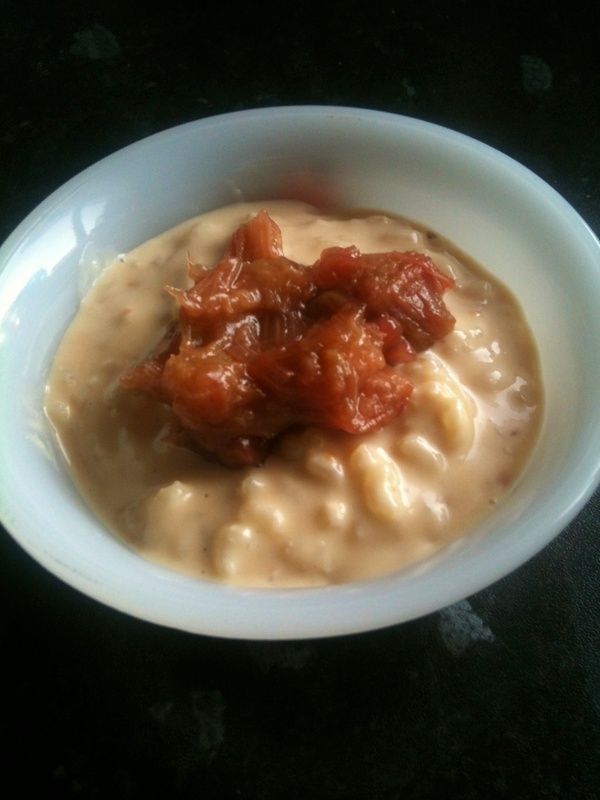 This food combo works and on the warm Easter night we ate it the stewed rhubarb lifted it from winter comfort food to an all season dessert. Normally I use full fat milk and if I am feeling outrageous I might add double cream(wow! Living life on a knife edge eh?) This time however I substituted 1 cup milk for evaporated milk. It gives the rice an almost “caramel” flavour, but watch out you cannot leave the lid on unattended(like the recipe) you must stir it or it will stick to the pan and you will have ruined rice pudding on your hands. You can do this one of two ways in the oven or on the hob. I choose easy and the stove top method. Bring to boil, turn down to simmer and cook until tender. Easy. Melt the butter in a pan on a low heat until foaming, add the rice and stir to coat. Continue to stir rice for 2-3 mins. Add milk. Stir again to sort of evenly distribute the rice. Bring to boil. Stir again. Cover and simmer on low for 20-25 mins. Take lid off pan, stir rice again. Add sugar. Stir. Turn off heat.